EXTRA: Arizona Public Media’s Nancy Montoya moderates a panel discussion, Migrant Justice Now, at 5:30 p.m. Thursday, Jan. 24. Three attorneys, Isabel Garcia of Derechos Humanos, Billy Peard of the ACLU and Eréndira Castillo of Castillo Law, will speak about efforts to repeal laws that disadvantage migrants, especially those caught up in the mass Streamline hearings. Her name was Maria-Julieta Lorenz Garcia. She died crossing the Arizona desert. Maria-Julieta lost her life in the blazing summer of 2010. So many border crossers died in that year's extreme heat that the Pima County morgue overflowed with the migrant dead. The medical examiner had to rent a refrigerated truck to hold the excess bodies. I wrote about that young woman with the musical name as pretty as a song. Maria-Julieta was from the cool highlands of Hidalgo in Mexico and she stepped into America for the first time on a day that the temperature shot up to 106 degrees. Out in the burning west desert of the Tohono O'odham Nation, she fell ill quickly. Her husband called the Border Patrol for help and she was flown to a Tucson hospital. But there was no saving her. She died of hyperthermia the next day, July 9, 2010. My painful memories of her tragedy came flooding back last week when I unexpectedly came upon her name at Etherton Gallery. Maria-Julieta is memorialized, along with 35 other deceased migrants, in "Migrant Memorial," a fiber artwork by Jennifer Eschedor. The piece pictures a migrant family hurrying toward a border wall lately festooned with concertina wire meant to shred the flesh of desperate crossers. On the other side of the black barrier is a cluster of white crosses, marking the places where immigrants have died, many of them, like Maria-Julieta, pushed into remote wilderness by the border enforcement that chases them away from safer crossings. Her name and the names of other migrant dead, along with memorials of some never identified, are arranged around this forbidding landscape. In the sky above is a burning yellow sun, filled with text reminding us that these 36 people are only a small fraction of those who have died in Arizona's killing fields. More than 3,000 migrant bodies have been found since the year 2000, including 1,047 in the nine years since Maria-Julieta died. Many more of the dead are never found: torn apart by animals, parched by the heat, their remains decompose and their bones turn to dust. 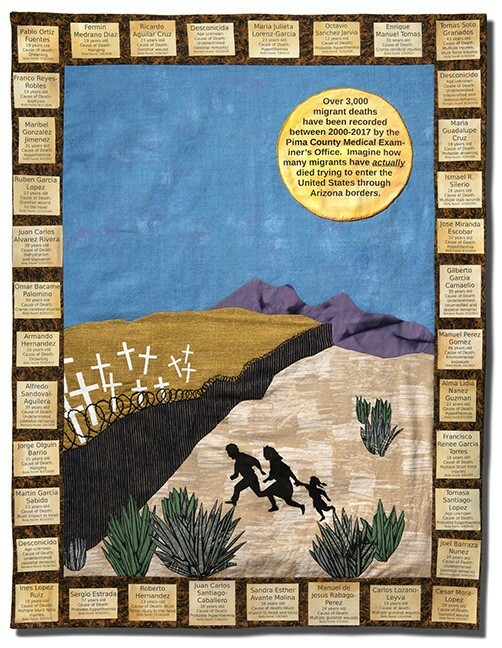 Eschedor's searing work of remembrance is one of some 50 pieces by 40 Arizona artists in the show In This Together: Sixty Years of Daring to Create a More Perfect Arizona. ACLU Arizona, celebrating its 60th year, organized the traveling exhibition with the help of art professionals, including Shelley Cohen, former head of the Arizona Commission for the Arts. Artists were invited to submit work that reflected ACLU's mission "to defend and preserve the individual rights and liberties" guaranteed to all by the Constitution. The nonprofit legal group proudly displays a chart of the Arizona chapter's many victories in the last six decades, from fights for interracial marriage to a case against racial profiling that led to Maricopa County Sheriff Joe Arpaio being found guilty of contempt. The fact that the ACLU grapples with serious social justice issues from immigration to free speech to civil rights doesn't mean that the works in the exhibition are all doctrinaire. Many are sober and some seethe with rage, but the art is lively and vivid. Some pieces are even joyful. Jake Early celebrates women of color in four brilliantly-colored portraits in giclée. Others revel in the pleasure of protest. Linda Ekstrum's "Mighty Girl," a bright color photo on aluminum, captures a radiant young girl proudly carrying an American flag, in a march supporting the migrant dreamers. 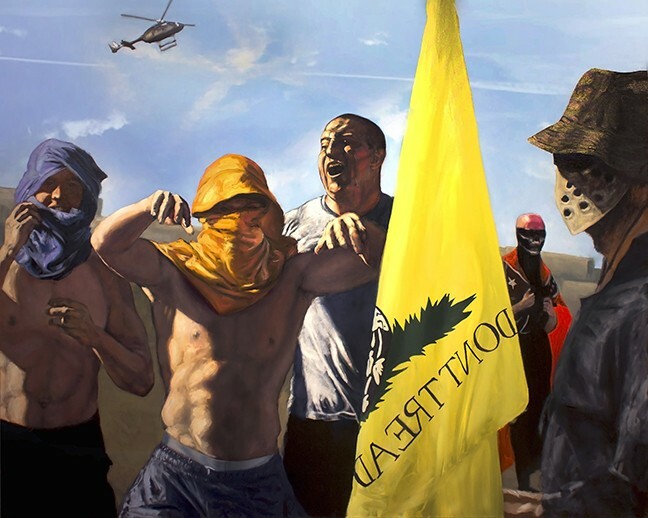 A masterful oil painting by Chris Vena, "Saturday, June 18th, Campaigns IV," features a bevy of jubilant men protesting with a helicopter hovering overhead and their yellow banner billowing in the air. 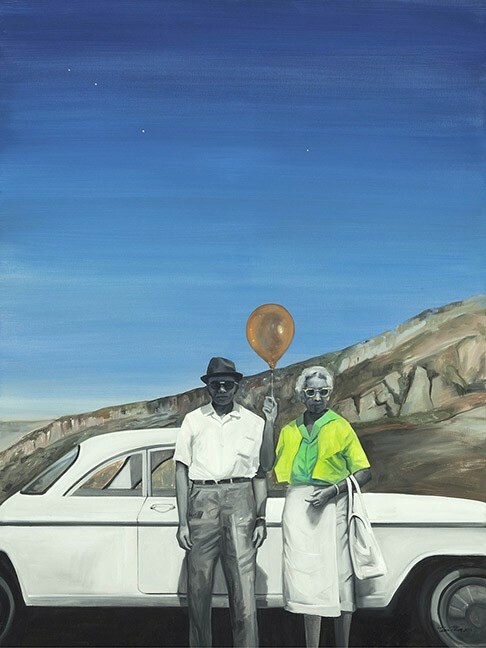 Tina Minion likewise delivers a major work in "Green-Book, Orange Balloon," a masterful oil on linen about discrimination against African-Americans in mid-century Arizona. Black travelers were banned from most hotels, and the fabled "Green Book"—the subject of the current movie—directed them to the scarce accommodations that would take them. In the painting, a black couple stands uncertainly outside their late-model car, in the shadow of an unwelcoming rock formation. Street photographer Stephen Marc zeroes in on the contemporary Black Lives Matter movement in an eerie noir nighttime image, "Protest March in Memory of Rumain Brisbon (killed by Phoenix Police)." Alexandra Jimenez cleverly merges ethnic pride with rights to the land in "La Gente," a bold silkscreen of Arizona's signature saguaros. The looming cacti stand in for "the people" of her title. Rand Carlson's tin work "Land of the Free" is an inclusive American flag and Barbara Brandel's "An Enduring Hope" is a bold Statue of Liberty made of postage stamps from countries all over the globe. Her fierce Lady Liberty defiantly welcomes the "tempest-tost" and "wretched refuse" so reviled nowadays in America's halls of power. This being Arizona, many of the pieces touch on immigration. Nationally-lauded Ajo photographer Tom Kiefer makes poignant still lifes of migrant belongings. He worked for a time as a janitor at a Border Patrol station, where one of his duties was to throw away personal things that the agents stripped away from the migrants. ID cards, wallets, even money, along with personal mementos, were all consigned to the trash. 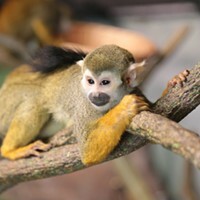 He began spiriting them away and photographing them at home. The two Kiefer works here demonstrate his typical MO: he makes carefully composed images of just one kind of object, in elegant, large-scale color photos. In "Billfolds and Wallets," 70-some wallets stand row on tidy row in a grid pattern, their rich colors shining against a dark background. In "Gloves," hundreds of gloves are arranged in a carefully layered heap, light-colored gloves lying atop darks. You can still see the desert dirt on the fabric. Kiefer's technique, like Echedor's counting of migrant deaths, reminds us of the scale of our state's desert disasters. His pieces are heart-rending. You can't help but wonder about the fate of the hopeful people who wore those gloves and carried those wallets as they trekked into what they thought was the Promised Land.